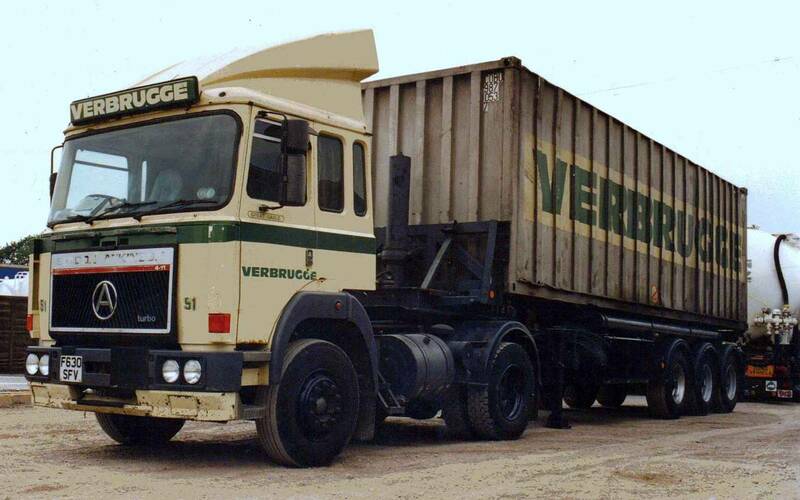 In 1987 Verbrugge Internationale Wegtransporten of the Netherlands wanted to gain a foothold in the UK market. To enable the company to do so they initially acquired Incobulk later changing the name to Verbrugge UK Ltd and locating in Felixstowe. 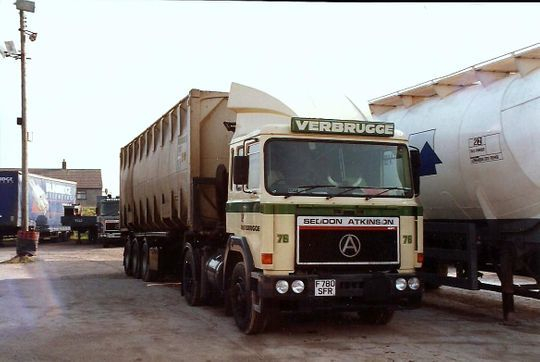 After the takeover W & J Riding continued to transport Verbrugge bulk containers for many years and allocated a number of Verbrugge livered Seddon Atkinson & ERF tractor units to the on going contract. 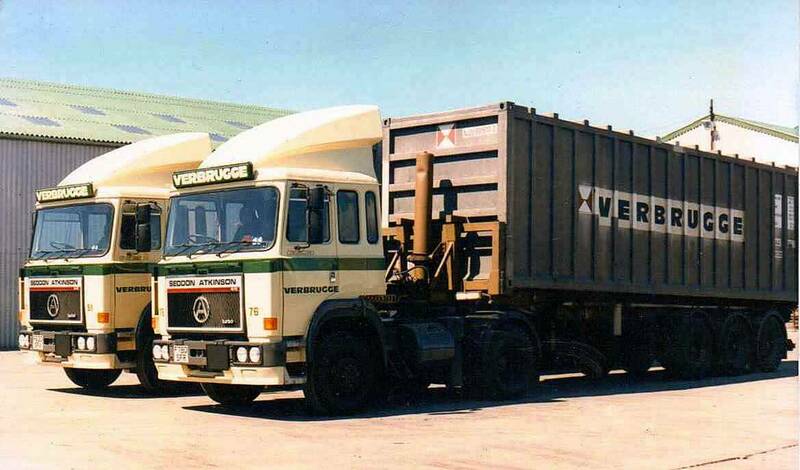 Today Verbrugge Internationale Wegtransporten has developed into a preferred logistic services provider for many customers in the paper & wood pulp, chemical steel & metals producing industry. 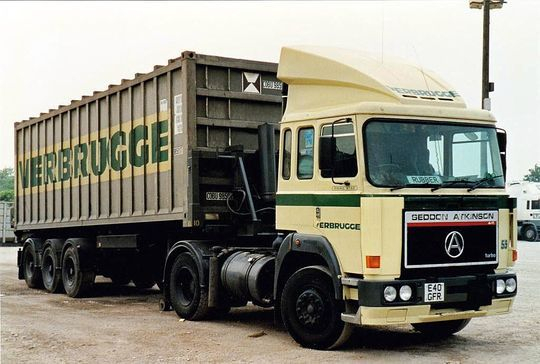 The first day of the contract in 1988 see's Seddon Atkinson 4-11 4x2 tractor unit Reg No F630 SFV Fleet No 51 'Great Gable', with driver David Ireland and Seddon Atkinson 4-11 4x2 tractor unit Reg No F780 SFR Fleet No 76 'Helvelyn' driven by the late Vic Mason. Tom Riding who took the photograph when the vehicles were brand new in August 1988 when the contract first began and calls this photograph the 'Likely Lads'. 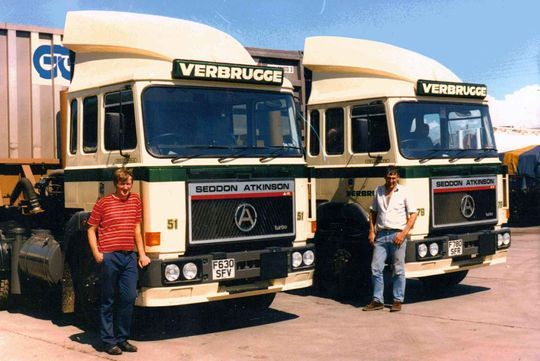 Another shot taken on the first day of the contract in August 1988 shows Seddon Atkinson 4-11 4x2 tractor unit Reg No F630 SFV Fleet No 51 'Great Gable' and Seddon Atkinson 4-11 4x2 tractor unit Reg No F780 SFR Fleet No 76 'Helvelyn'. Both these tractor units were registered new on the 1st of August 1988 in preparation for the contact which began later that same month. 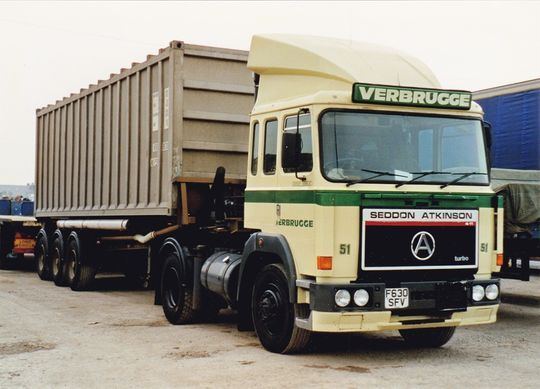 Seddon Atkinson 4-11 tractor unit Reg No E40 GFR Fleet No 55 Rising Star, powered by a 290 LXDT Gardner engine, was registered new to Riding's on the 1st of September 1987 at a cost of £28.716 plus VAT. A couple of years later it was repainted and allocated to the new Verbrugge contract in 1989. 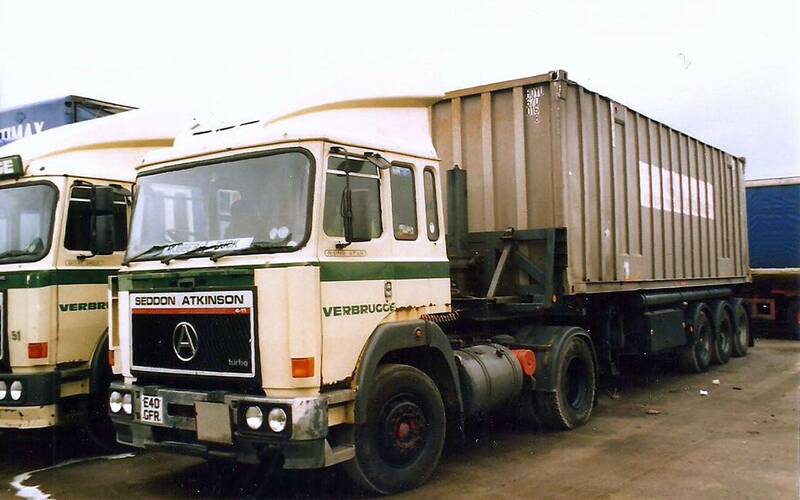 Another shot of Seddon Atkinson 4-11 tractor unit Reg No E40 GFR Fleet No 55 Rising Star. Seen here on the 26th of March 1995, when eight years old, it is now looking rather the worse for wear as rust begins to eat into the cab. Just three months later, after this picture was taken, E40 GFR was withdrawn from the fleet and sold on the 6th of June 1995 to local dealer Syd Hartley for £2.600 plus vat. 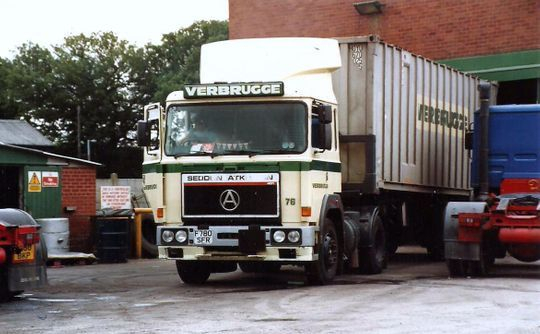 It was later bought by France and Wood of Marsden near Huddersfield who ran it on general haulage until it was finally scrapped in 1999, see Life after Riding's. 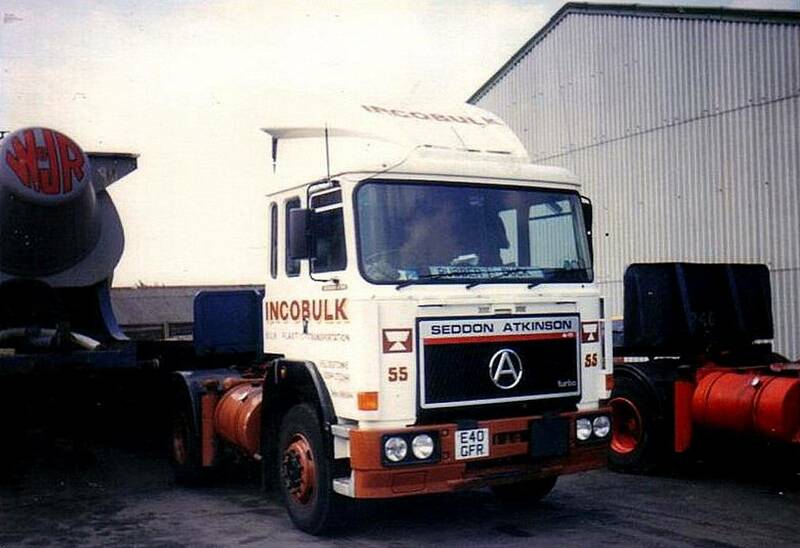 Pictured here when relatively new is Seddon Atkinson 4-11 4x2 tractor unit Reg No F630 SFV Fleet No 51 'Great Gable'. Driven by David Ireland it was registered new on the 1st of August 1988 at a cost of £28,878. 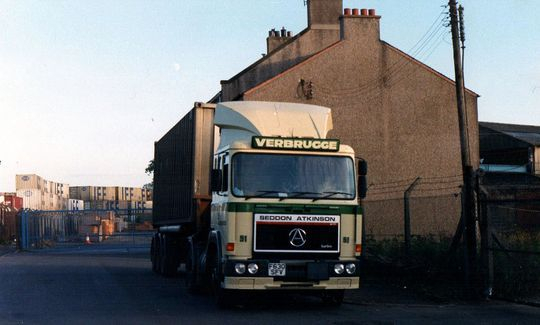 Seddon Atkinson 4-11 4x2 tractor unit Reg No F630 SFV Fleet No 51 'Great Gable' is seen here on Thursday the 13th of July 1989 parked outside a container base at Grangemouth Scotland. Driven by David Ireland F630 SFV was registered new some twelve months earlier the 1st of August 1988 at a cost of £28,878. Photograph courtesy of Alan Fleming. 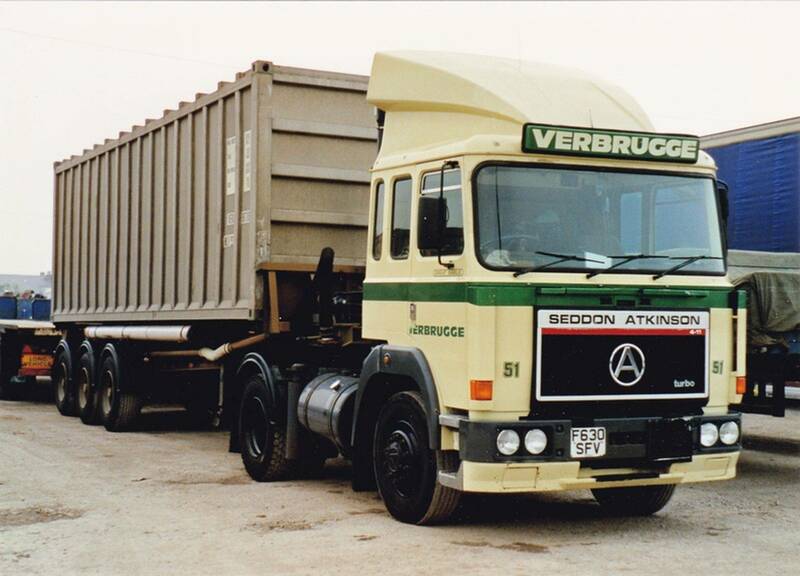 Seddon Atkinson 4-11 4x2 tractor unit Reg No F630 SFV Fleet No 51 'Great Gable' is seen here some years later still working on the Verbrugge contract. It is coupled up to a 33 foot skelly tipping trailer with a 30 foot Verbrugge container on board. 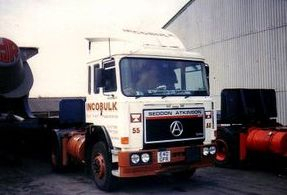 Note the Seddon Atkinson grill logo has now virtually disappeared with constant washing of the vehicle over the years. 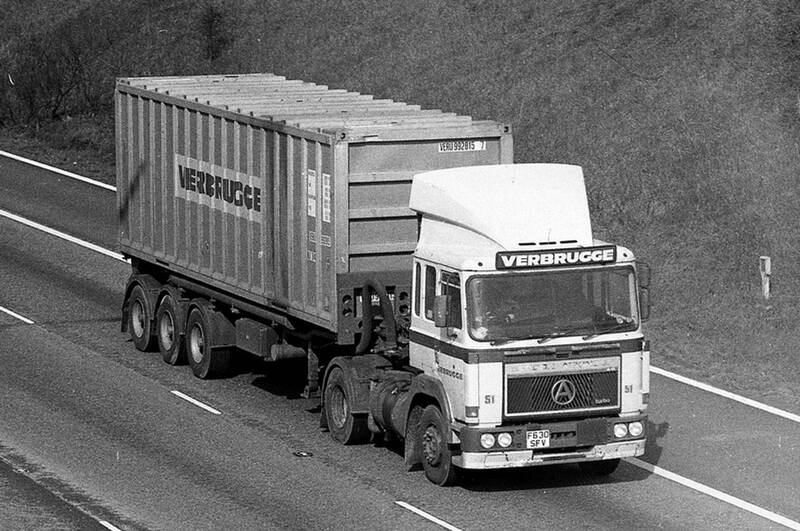 An on the road shot of Seddon Atkinson 4-11 4x2 tractor unit Reg No F630 SFV Fleet No 51 'Great Gable' hauling one of the familiar Verbrugge containers down the motorway. Registered new by Riding's on the 1st of August 1988 it's regular driver for many years was David Ireland. 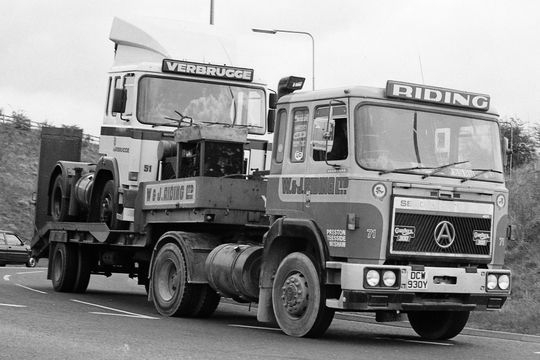 W & J Riding's Seddon Atkinson 401 4X2 tractor unit Reg No DCW 930Y Fleet No 71 'Vanguard' is pictured here after coming to the rescue of Verbrugge livered Seddon Atkinson 4-11 4X2 tractor unit Reg No F630 SFV 'Great Gable'. It was destined for Riding's workshop's within Longridge depot were it would be going for repair. 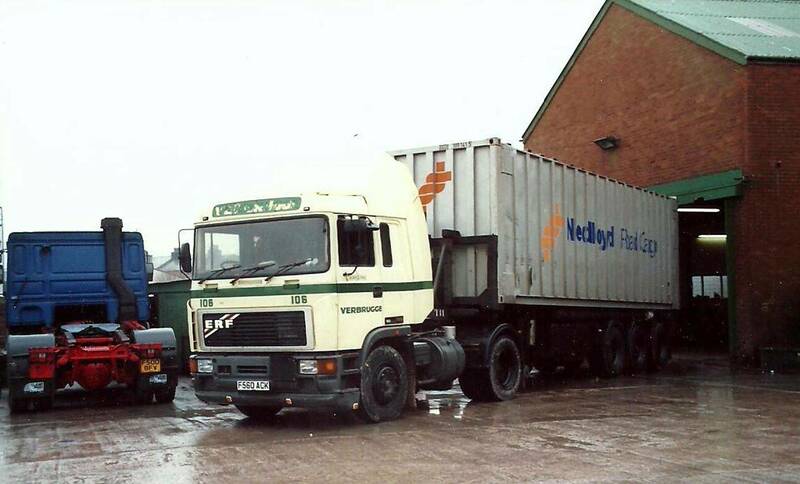 Seddon Atkinson 4-11 4x2 tractor unit Reg No F780 SFR Fleet No 76 'Helvelyn' was registered new on the 1st of August 1988. 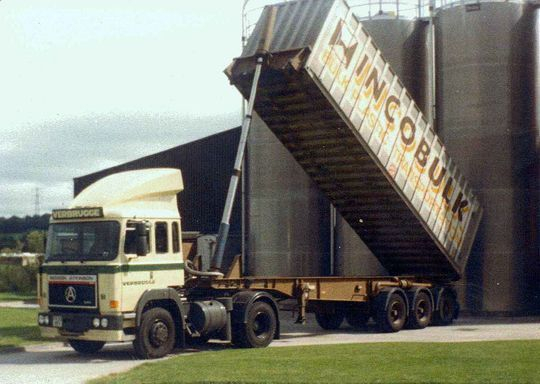 Driven by the late Vic Mason it is pictured here tipping an old livered Incobulk box on a 33 foot tipping skelly trailer while discharging it's load at Mold in North Wales. 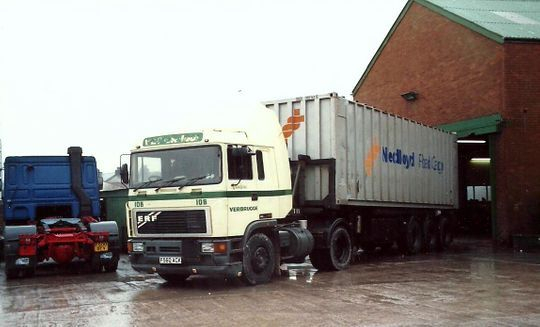 Seddon Atkinson 4-11 4x2 tractor unit Reg No F780 SFR Fleet No 76 'Helvelyn' was registered new on the 1st of August 1988 and driven from new by the late Vic Mason. Pictured here when just over four years, on Sunday the 14th of February 1993, it is parked up for the weekend in the depot at Longridge. Another shot of Seddon Atkinson 4-11 4x2 tractor unit Reg No F780 SFR Fleet No 76 'Helvelyn' which is now looking rather tired by this time this picture was taken in 1995. Driven by the late Vic Mason it is seen here after reversing its 33 foot tipping skelly trailer on to the tyre bay in the depot at Longridge. ERF E10 4x2 tractor unit Reg No F560 ACK Fleet No 106 'Scafell Pike' was powered by a Cummins L10 325 engine. 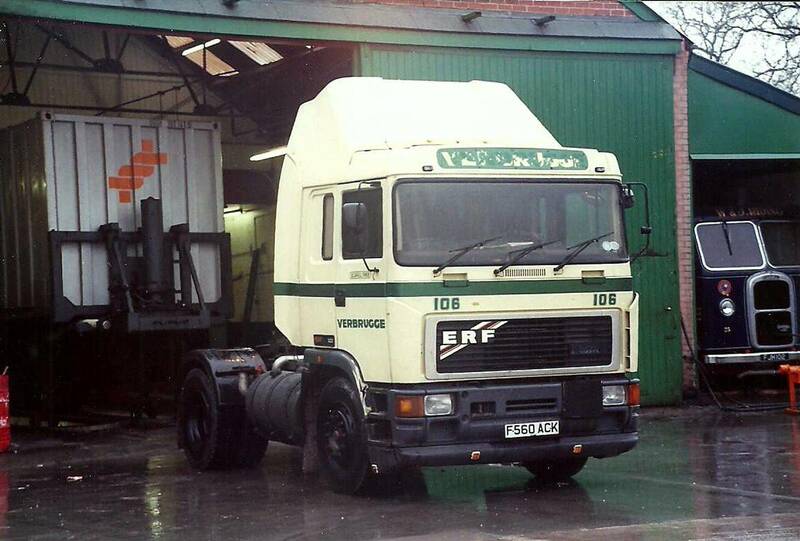 Registered new on the 10th of February 1989 this was one of only a small number of ERF 4x2 tractor units assigned to the Verbrugge contract. Another shot of ERF E10 4x2 tractor unit Reg No F560 ACK Fleet No 106 'Scafell Pike'. Powered by a Cummins L10 325 engine, and registered new on the 10th of February 1989, it is seen here on the 21st of November 1992 while backed into the tyre bay at Longridge depot.